The vanilla cakes from last week were delicious, but we had two leftover and I hate having to throw food away. The perfect solution came to me when I woke up this morning and needed to figure out breakfast. It turns out that mini-cakes turned into french toast equals deliciousness. I was worried that the cakes would be too sweet or have too much vanilla in them, but I didn't add much vanilla to the egg soak and they turned out great. Slice cakes into 1/2 " slices. Combine eggs, buttermilk, vanilla and salt in a small container and add vanilla cake slices to container to soak for 20 or more minutes. Heat butter in a non-stick skillet and fry french toast for 3 - 4 minutes per side. Top with fruit and maple syrup. Good thinking! I love when leftovers come together as something new and yummy. Fabulous idea! I bet they were delicious! What a great way to start the day! Looks delicious. That cake was already so yummy, this breakfast would certainly be out of this world, especially with that apple topping :). Such decadence! Sounds like an ingenious use for cake to me. 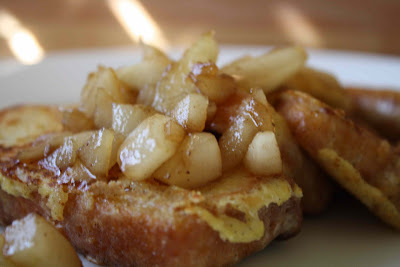 I'm gaining five pounds just reading about your french toast. Bet it was wonderful though! The flavor of vanilla is one of my favorite. These leftover cakes are honestly to die for. I almost want to make sure I have cake leftovers so I can do this! Thanks for the great idea! 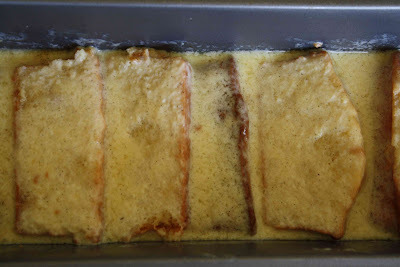 Vanilla cake French toast sounds good and looks great!